Choco Chai is a festive blend of cinnamon, cardamom, ginger, cloves, pepper and cacao shells. 90g bag. 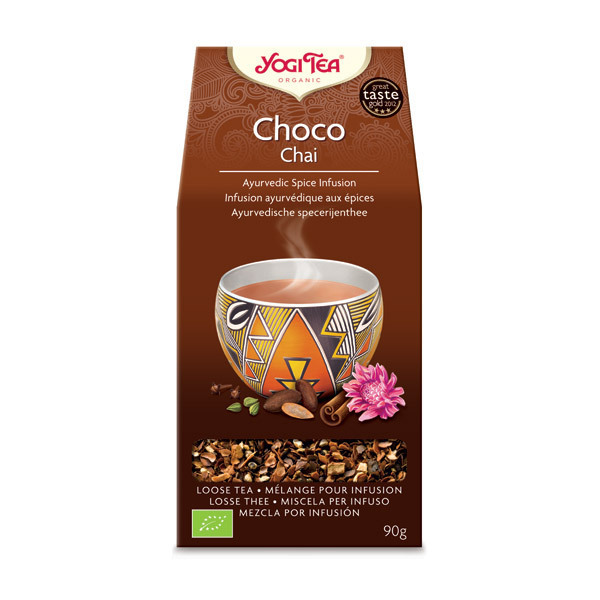 Yogi Tea has recreated an ancient Aztec recipe blending herbs and spices with cacao beans. Enjoy this Choco Chai as an exciting drink called "Xocoatl"! Add 1 to 1.5 teaspoons (1.4-2g) to 1 liter of boiled water and simmer for 15-20 minutes. Strain. Add warm milk and sweetener to taste. Take a sip before adding your favourite sweetener and/or creamer!